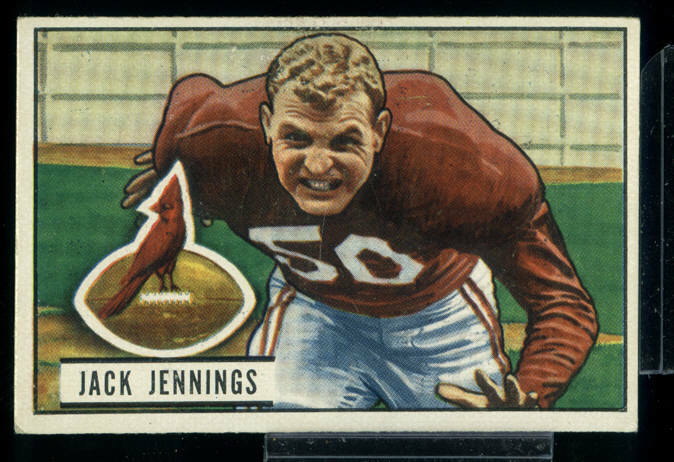 Jack’s Chicago Cardinals football card. The year they won the Rose Bowl, The Ohio State Buckeyes went 7-1-2. In recognition of the 100th Rose Bowl this week, I wanted take a minute to talk about good ol’ American Football. I miss our Saturdays in the USA where we saw drama unfold on a piece of turf 100 yards long. Football, American Football, has been a part of my life for as long as I can remember. The Rose Bowl is an important game to us as well. My grandfather, Jack Jennings, was a captain of the 1950 Ohio State Rose Bowl champions when they defeated Cal, 17-14. He was an offensive tackle who was drafted in the second round (#21 overall) and played for the Chicago Cardinals. He retired from the NFL after nine seasons. At Ohio State, he lettered in both football and basketball. By the time I came along, he was back in Ohio. I remember times when he took me to the Horseshoe in Columbus and showed me around. I remember listening to O-H-I-O, making its way around the stadium. I remember the times he took me to the “Varsity O” reception room, where alumni student athletes would gather before, during and after the game. I remember shaking the hands of those giant men, who seemed even larger from my youthful perspective. Between my father and grandfather, we watched any game we could. We had a picture ON picture television. The TV in the den was a large console-type model. In the bedroom, my father had a portable black and white TV. We only had a few channels back then (pre-cable and satellite days), but games did come on different channels at the same time. My father would set the portable TV on top of the console TV. Voila! Picture ON picture. Living in England this year, we have missed good ol’ American Football. The time difference makes it a little tough to catch many games. They often start in the middle of the night. I often get up on Sunday morning and drink my coffee while watching the highlights of Saturday’s games. I enjoy the effort, the sport, the strategy, the competition of a good game. These young men pour their hearts out on the field for themselves, their families, their thousands of fans, and the legends that overshadow them. I watched my grandfather, years after his grid iron glory years, appreciate the game. If you are a football fan (or any sport fan) don’t lose your appreciation of a good game. Don’t let the efforts of 11 young men, whom you’ll likely never meet, determine your happiness for any given day, week, month, or year. Don’t let them determine your happiness if they win or lose to your rival or make it to the big game. It is just a game. As a fan, you owe it to everyone involved to remember that. Grandpa Jack always kept that perspective. I am thankful for such a lesson from a giant of the game–at least to the eyes and memories of this once little boy. I am going to try to apply those lessons to some new sports on this side of the Pond. I owe to my children to share those same lessons, no matter what the sport.